Completely Hydraulic started with 1 man and has now expanded into 4 outlets. It aims to provide quality services at good prices and put a smile on people's faces using a customer-centric approach. The company is aiming to increase their impeccable hydraulic hose service and repairs locally in their depots. Completely Hydraulic, a company reputable for providing high-quality hydraulic, pneumatic system and services to various industries, is glad to announce that its customers in and within London and M25 can now enjoy their top-notch services. The UK-based fast-moving company, with their four depots in London, Essex, Kent, and Heathrow, is well positioned to meet the needs and demands of their teeming clients in those local areas. The hydraulic hose provides a means for transporting fluid from one component of a machine to another. It also supplies an inherent versatility to designers. Implying that a hose is an essential part of a hydraulic system is an understatement because it provides the flexibility that enables components to be positioned in the most efficient and convenient places. A hose can bend around corners, through tight spaces, or across long distances. Despite their usefulness in machines, a hydraulic hose has a finite lifespan and can fail, so it needs to be repaired or replaced by professionals. Completely Hydraulic, UK’s number 1 hydraulics company, specialises in all forms of hydraulic related services, which include hoses, repairs, parts, fitting and problem-solving solutions. They provide hose repair services to customers of all sizes and regardless of the hose size – from power steering hoses, plant machinery hoses, hydraulic bridge hoses, to piling rig hoses. In addition, they also sell high-quality hoses to customers who may be in need. With four depots in London, Essex, Kent, and Heathrow, customers can visit the trade counters in person with any hose related issues and their highly trained, professional staff will help, replace or advise on the best way forward. “Our products and services are growing rapidly, as we have a supportive staff and reliable suppliers with whom we maintain the best of relationships, ensuring that the best resources are available to us and in turn, you the customer,” said Jason Pattinson, Completely Hydraulic CEO. 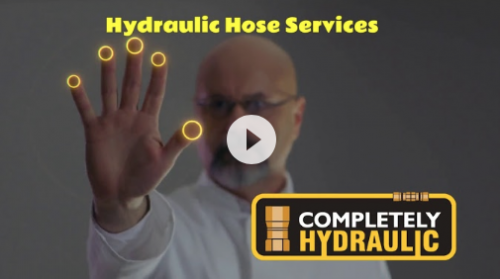 Completely Hydraulic is committed and dedicated to meeting the needs of each customer in terms of hydraulic hose services. The company helps businesses to grow by reducing downtime. They are open for business 6 days a week; Monday to Saturday. You can as well call or email them for emergency hydraulic repair and their professional customer care agent will provide a swift response.